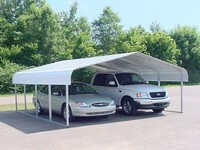 A great solution for protecting two smaller vehicles, our 18-foot wide metal carports combine strength and efficiency. A heavy-duty, galvanized steel frame and a 29-gauge steel roof form the foundation of each structure, one effectively keeping out UV rays and water and resistant to rust, rot, termites, and fire in the process. For accessing your car or other vehicle, the open, valance design simply lets you drive in and out without moving a cover. When a long-lasting, sturdy shelter is required for regular outdoor use, find all qualities in our 18-foot wide metal carports. For getting the right level of coverage, browse through several heights and lengths in our selection.